As part of the University of Western England, Hartpury College is one of the premier sports and agricultural colleges in the UK. It already hosts an international three day horse trials as well as international dressage events and myriad other high-level sporting events. It is also the official training ground for nearby Gloucester Rugby Club. 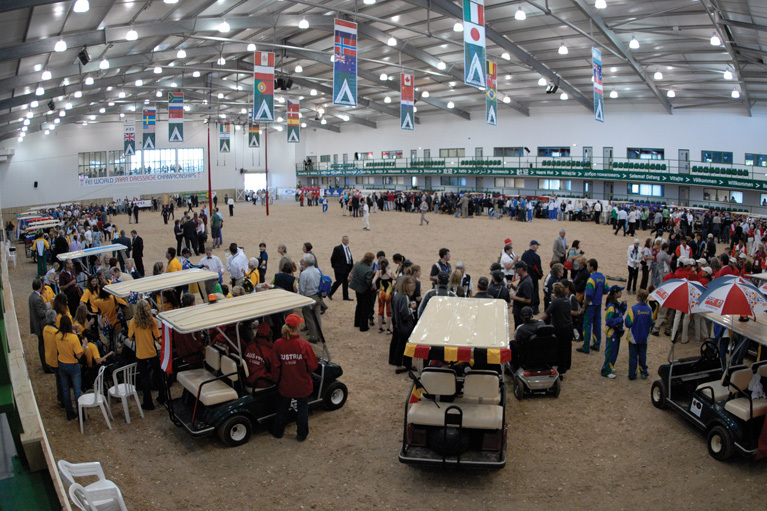 Hartpury has recently unveiled its new £4m indoor equine arena. To match this state-of-the-art facility, the college approached Show Hire to design and install a permanent public address system to cover the large indoor arena as well as the public seating, corporate boxes, and substantial restaurant and bar areas. Show Hire supplied and installed an Electro Voice sound system in the main arena comprising 12 SX300 and ZX5 speakers. Using DX38 processors, these are all set up on delays to provide perfect echo-free coverage of the massive indoor arena space. Show Hire also installed a separate system for the restaurant and bar areas using Electro Voice Evid 3.4 speakers. These can all be separately controlled from the restaurant area, providing perfect sound levels for diners, whatever the ambient noise levels. Full-range, high-powered bass response ceiling speakers were installed in each corporate box with a separate volume control, allowing occupants to adjust the sound levels to suit their own individual requirements. In the commentary box, Show Hire installed a Sennheiser radio microphone system for commentary as well as demonstration purposes. Show Hire also supplied amplifier racks, Allen & Heath mixing facilities and an infra-red hearing aid system. If you would like any further information on the systems we supplied to Hartpury, or any other matter, please do not hesitate to contact us directly.